If you’re considering outsourced marketing help for your practice, you’ve probably looked up local marketing agencies. Currently, there are a little over 60,000 PT Businesses in the US, around 50% of which are private outpatient clinics. Of those, our best estimate is that only 6-7% use a marketing agency specific to physical therapy. But is a local agency more important than a specialized one? …Is it better to know the area, or to know physical therapy? There will always be a certain level of comfort with business done in person. Many practice owners, even many business owners, in general, feel that virtual communication doesn’t hold up in a business. Many feel the stress of relying on video conference software isn’t worth it. I TOTALLY understand this. If lack of in-town meetings is something you absolutely can’t do without, you should probably consider using a local marketing agency. My only challenge would be this: give the potential benefit honest consideration. If a non-local agency has physical therapy expertise and a track record of New Patient results more than the local agency, be willing to try a virtual meeting or appoint someone in your practice who handles the virtual part and reports to you. If you can attract all the patients you need to grow your practice through local ads such as newspaper, billboards, or TV, then you may want to hire a local marketing agency. Of course… I write this assuming it doesn’t include most readers. That’s because the days of traditional advertising being enough are gone. Because these ads are designed for awareness, which is only one small part of marketing. Awareness ads are where the “local connections” advantage ends. Now don’t get me wrong – local awareness is a great tool especially in certain areas. But, it needs to be kept from overwhelming your overall marketing goals when in fact, awareness is just a start. Awareness isn’t designed to convert a patient – there are more steps than that. The goal of an awareness ad is simply to get people to seek more information. You see an interesting billboard or TV ad, what do you do? Google it. Maybe if it was a really good ad you remember their website exactly. At this point, the billboard can no longer help you. It’s up to the website or Google listing to convince you to take the next step, and the next, eventually becoming a customer and Boom – you’ve been funneled. If you don’t take the step on your website? Digital marketing can get you back. 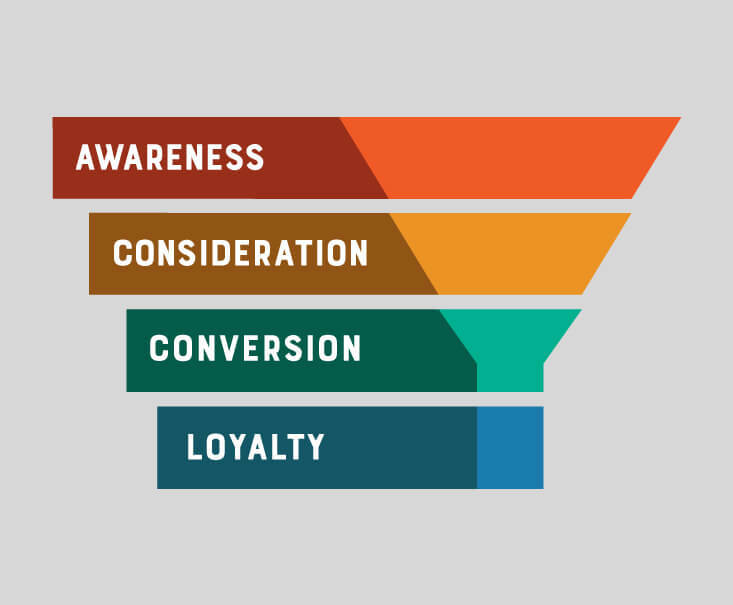 Traditional local marketing isn’t bad but when choosing a marketing agency, local connections only apply to early stages of the marketing funnel. You owe it to yourself & your practice to keep the entire marketing funnel in mind when making your decision. For any business, an industry-specific marketing agency carries the advantage of knowledge, data, and research in both marketing AND your market – PT in this case. The hours and years spent learning a complicated field like PT will prove to be a valuable resource. You’ll be able to trust them more with copywriting and other decisions that will save you time. 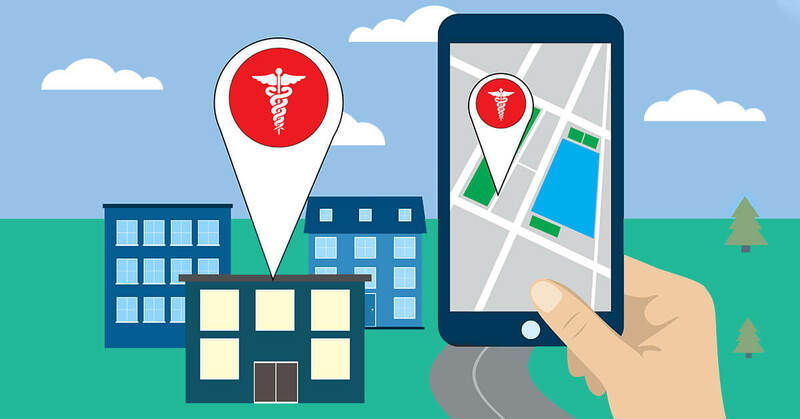 … And, our partnership with PT Wired allows you to get a custom clinic app included in your marketing plan – all valuable tools that wouldn’t be possible from a local outfit. Have you ever had a conversation with someone who just doesn’t understand what you really need from them? They don’t seem to understand just how crazy your life is trying to run a PT Clinic while treating patients? Hiring a marketing agency whose leadership has also owned & operated a PT Practice will go a long way towards eliminating that frustration. If you could market your practice based on what has and hasn’t worked for hundreds of other PT Clinics, would you do it? When you use PT-specific agency, decisions are made based on decades of experience from other practices. Following the last point, a national agency has PT experience without your direct competition being involved. If someone local to you has experience and good results marketing PT, you could get the best of both worlds! But first, make sure your direct competition isn’t involved with them as your results could suffer from the conflict of interests. This is an often overlooked benefit of looking beyond city limits for a marketing agency. Depending on your city, there could likely be a very limited number of really talented marketing employees. Being willing to consider a national agency broadens the pool of talent likely to be helping you. Practice Promotions, for instance, is actually a remote team. Our employees currently span the South-East United States which means we hire based purely on skill, personal character, and even the ability to communicate virtually. For some local businesses such as coffee shops, restaurants, retail stores, etc. it still makes sense to have a marketing agency that is local. But, Physical Therapy is a specialized industry where expertise trumps location. A marketer who doesn’t know the industry – even if they’re good – will need you to babysit copywriting, will take time to learn your ideal audience, and is unlikely to have the experience to draw on from working with hundreds of practices before you. Google is to the point where they probably know your area better than anyone. They give huge benefits to local businesses but managed through an online listings account. And, there are more people searching online for pain relief near you than there are responding to billboards. 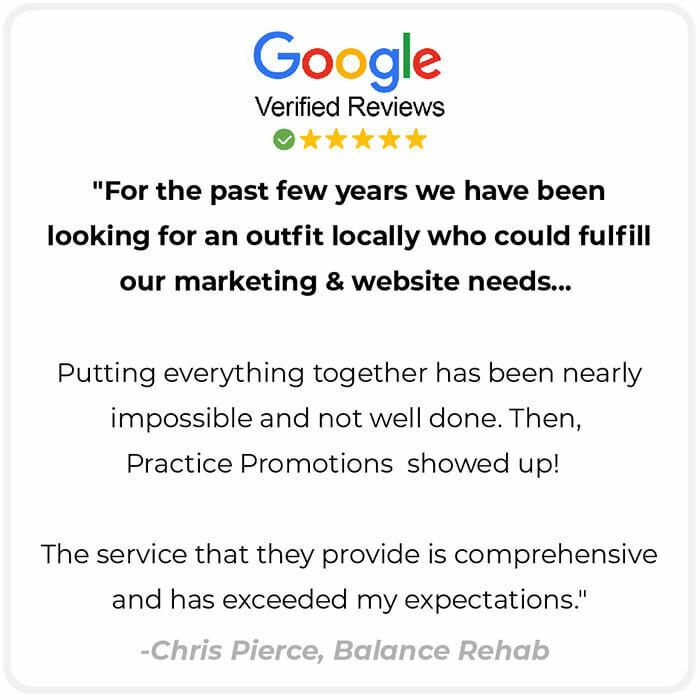 That’s why our primary focus marketing PT practices is making them HIGHLY discoverable on Google, Maps, local listings such as Yelp, and general SEO. If you truly want to grow your practice, simply do what successful practices are doing. Make your decisions based on results & expertise – if you do, it will soon be YOU that is the local expert.